The first months of 2016 have been filled with news about the box office performance of foreign and local films in the Chinese market. Experts are assuming that the Chinese box office total will overtake the US total next year. Fueled by more disposable income from a growing middle-class, companies such as Wanda are building more and more cinema screens across the country. 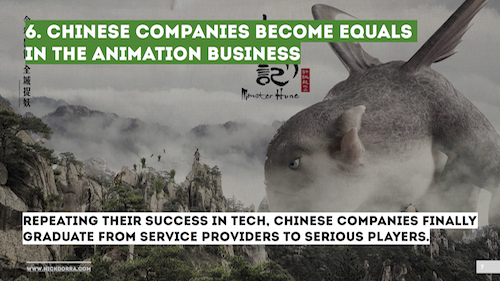 But as the local feature film market remains heavily regulated, the more interesting development from an indie animation producer’s view is how Chinese animation companies are growing up. Exactly as things evolved first in manufacturing and then in digital technology, Chinese companies are graduating from cheap labour service providers to proper partners.